Take a peek at some of Fiordland’s special birds that are difficult to see in the wild. A great family friendly place to visit. Bring a donation for the daily feeding tour. Spaces are limited so arrive on time to secure your spot. School groups and tourist operators can book a private tour in advance through the Visitor Centre, subject to availability. Takahē are the stars of the Te Anau Bird Sanctuary and meeting these prehistoric-looking characters is a 'must do' for Fiordland visitors. Join a DOC ranger as they feed, Uncle Aka, Wheto, Tumbles and Kawa each morning. Uncle Aka is a retired boy and enjoys the quite life of the Sanctuary. His new companion Wheto, was hatched on Mana Island and after spending some time at Tāwharanui Open Sanctuary join Aka in Te Anau. Kawa and Tumbles are an infertile pair however they play a unique and important role in the takahē breeding programme – they still have all the instincts for making a nest and have successfully hatched and raised chicks from other takahē pairs. These foster parents do an incredible job raising their young and were celebrated as New Zealand Goodsorts in December 2017. More about the Takahē Recovery Programme. The Kākā is a beautiful native forest parrot, generally heard before they are seen. They have olive-brown feathers with brilliant flashes of orange and scarlet under their wings. 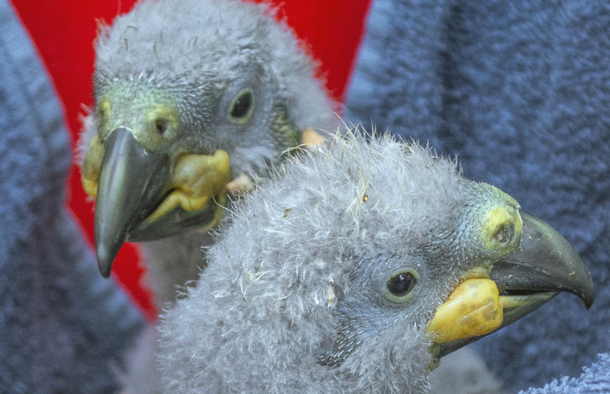 Chicks hatched at the Sanctuary are released into the wild to further boost kākā population. You can also enjoy close-up encounters with kereru/New Zealand wood pigeon, tūī, ruru/morepork and paradise shelducks. Silvereyes, grey warblers, tomtits, bellbirds and fantails are often seen feeding in the bush while the crested grebe and little shags can be seen at the lake's edge. The abundance of birdlife makes Punanga Manu o Te Anau/Te Anau Bird Sanctuary the perfect place for practicing wildlife photography. The birds held in aviaries here have either been injured and cannot survive in the wild, or they are involved in captive rearing programmes. The injured birds are rehabilitated and if possible, released back into the wild. Enjoy an easy walk along the lakeside in Te Anau that takes you to the bird sanctuary where you can see the rare, flightless takahē, kākā and other birds. Te Anau Wildlife Centre will join DOC’s kākā captive breeding programme after resident birds successfully reared chicks this summer. Receive monthly updates about conservation in Fiordland and the people making it happen.